Hello! And welcome to Antoniotti Chiropractic Health News! This is where we will keep you updated on all things Health and Wellness related. Our goal is to continue to share our passion for chiropractic, health, fitness and nutrition through this page. We hope you stop by often, contribute to the conversation, and ask lots of questions! So let’s start with Fitness. This past Friday, Dr. Steve and I were guest speakers for Kalamazoo’s premiere personal training group, Genesis Fitness and Wellness. Their goal was to learn more about the anatomy and functional training for the low back and core. This is an area that both Dr. Steve and I are passionate about, as it blends our athletic backgrounds with our geeky fascination with anatomy and fitness. Genesis personal trainers specialize in helping adults improve their health and fitness levels by doing in-home personal training. Many of their clients have low back pain (80% of the US population experiences low back pain at some point in their lives), and they know that providing their clients with the most effective exercises and stretches can not only relieve their pain, but also prevent further injury. We had a lot of fun teaching this information and getting to know the team at Genesis. We also know how helpful this information can be for anyone with or without back pain. Therefore, we will be sharing one exercise each week on our blog that will help improve your strength, flexibility and decrease low back pain. 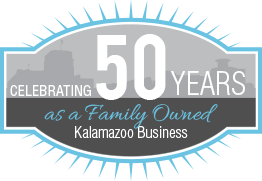 Our goal is to help our Kalamazoo community get healthy and stay healthy!